New book “Love Lost Love Found: A Woman’s Guide to Letting Go of the Past and Finding New Love” unlocks a woman's power to become magnetic to true love. Thousands of women are turning to this book as a source on how to get over a break up, heal from a broken heart, improve their self confidence, move forward and increase their level of love towards self. You can tell this book is from the heart…this book encompasses sooooo many self-help books into one…I’ve read many, look no further than this book if you are building a foundation of love of God, self and others. Certain people and events impact and leave their mark on one's life. Some feel warm and fuzzy, outright blessed, while others hit an individual like bullets to the heart. However, what lies behind an individual as opposed to what lies before them, are tiny matters compared to what lies within them. But how can one really let go, move forward and find new love, if nothing changes in what lies within? “Love Lost Love Found: A Woman’s Guide to Letting Go of the Past and Finding New Love,” a newly-released book by author, entrepreneur and lifestyle consultant Tatiana Jerome, is one of the very few books out there that deals with the real and increasingly socially corroded issue behind any relationship: often forgotten, that love is within, or rather, that each individual is a source of love. And that genuine love, in all relationships, is possible only when people are in love with themselves first. A new discover in learning how to love themselves and rebuild self-confidence. The ability to let go of the past as well as these once valued relationships and move forward. The knowledge to finding true, lasting love in this modern world while being able to achieve their life goals. “In life, many often marinate themselves in the painful soup of love, loss, and lament. Many cross-examine themselves for faults, things they should or shouldn’t have done, and things they could do to fix something that’s broken. They buy traditional self-help books or take long runs with blaring earphones to have at least a brief respite from the hurts. They keep forgetting that no one is spared from bullets to the heart, but no one has to stay hurt. Healing can only begin when an individual learns to love themselves. The other thing is forgiveness. When a relationship ends, it’s more than natural to lament and become self-indulgent. However, people are all one in pain, including lost loved one. Humans act from pain and can make mistakes from the pain, but many need forgiveness to make better decisions,” said Ms. Jerome. “Love Lost Love Found: A Woman’s Guide to Letting Go of the Past and Finding New Love” underlines that many cannot process feelings mechanically or surgically remove bad parts from within. Instead, people need to find out how they can be stronger, wiser, and more compassionate from their experiences. “Many people are blinded by the messages of self- depreciation and not being good enough, as well as the business of trying to improve their external environment. My book is here to make more and more women realize that if they were to really listen and be led by their spirit and God, they can learn to let go, love, be at peace and go after their goals,” said Ms.Jerome. 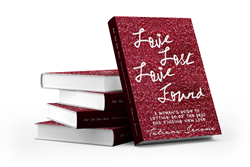 “Love Lost Love Found: A Woman’s Guide to Letting Go of the Past and Finding New Love” is available as an e-book and as well as a physical paperback book at https://lovelostlovefoundbook.com. As a lifestyle consultant, Tatiana Jerome believes in the empowerment and value of people. She urges people to learn to let go, love, be at peace and go after their goals with her. Based in New York, NY she is an entrepreneur who believes that anyone can succeed in love, business, health, finances, overcoming negative thinking and embracing spiritual oneness.